Travel management companies come in all shapes and sizes. Each has its own identity, specialties and mission. Ask 30 TMCs who they are and what they do best, and you’ll probably get 30 different answers. 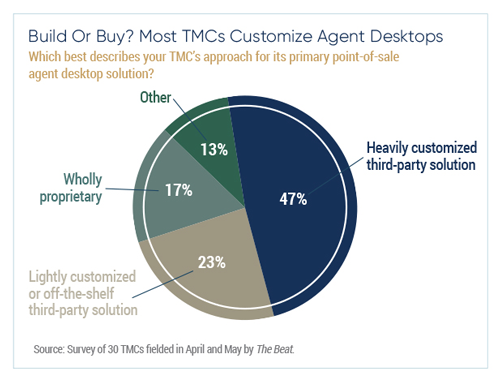 These days, some of the largest TMCs identify themselves as technology companies. But Egencia, the corporate travel arm of online travel giant Expedia, says consumer-facing technology is in its DNA. 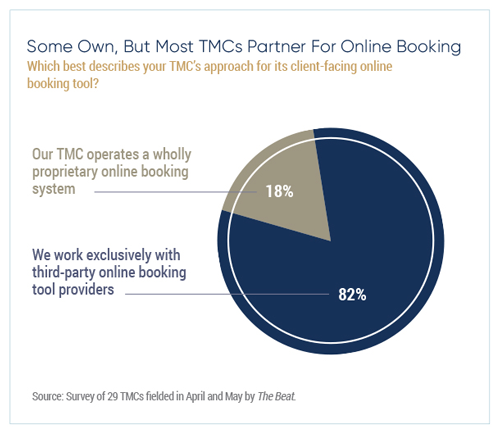 The TMC owns and operates a proprietary online booking system, its own travel agent point-of-sale application and its own traveler-facing mobile application that includes booking capabilities, in-trip support and itinerary guidance. In these regards, it supports its own core technology, while its platform approach incorporates others. Of course, Egencia can answer phones for client travelers in plenty of countries, and service is always part of a TMC’s calling, but technology—the “full stack,” as Egencia calls it—is core to its identity and investment. Egencia president Rob Greyber sees others following. Not all TMCs have the wherewithal to spend on technology in the same way as Egencia, Amex GBT and CWT, nor have the interest in doing so. Not all fancy themselves tech companies. 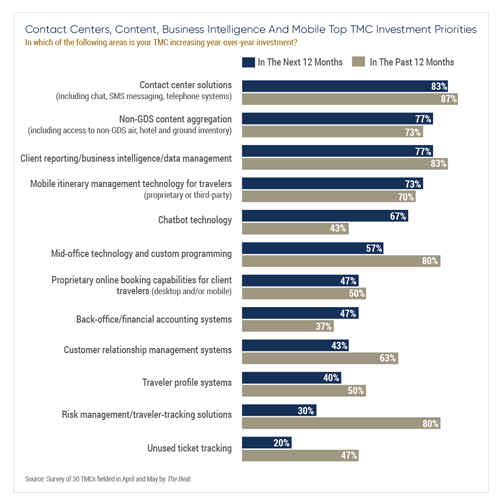 In the next year, 25 of 30 TMCs polled by The Beat plan to invest in their contact center solutions. Omnichannel is in, and many TMCs are expanding or have expanded the channels client travelers can use to reach frontline travel agents. Manyagency execs note that many traveler/agent interactions still are conducted by phone, but additional modes are finding their places. They include email, Web chat and text messaging. While GDSs furnish the majority of air, hotel and ground content that TMCs sell and support, fragmentation persists. 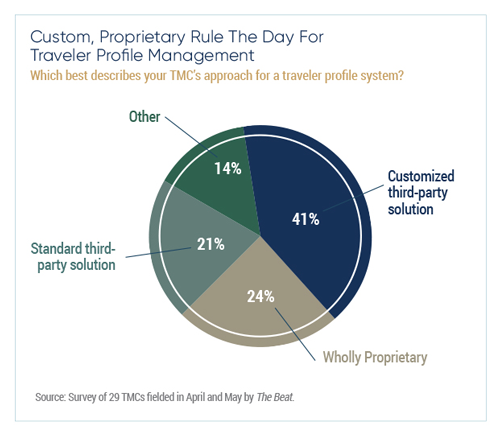 No surprise, then, that it’s a top priority for TMCs, which for many corporate clients play the principal role in delivering travel information through reports, Web-based dashboards and other means. “I remember back in 1993 when Excel had 4,000 rows, and that was business intelligence,” Travel Leaders Corporate SVP of corporate sales Michael Boult said at the BTN Group event. In the decade since the launch of the iPhone, having a mobile presence has become a minimum requirement for TMCs. Corporate travel agencies have several ways to tick this box for clients, including building, buying, partnering or referring for a solution. 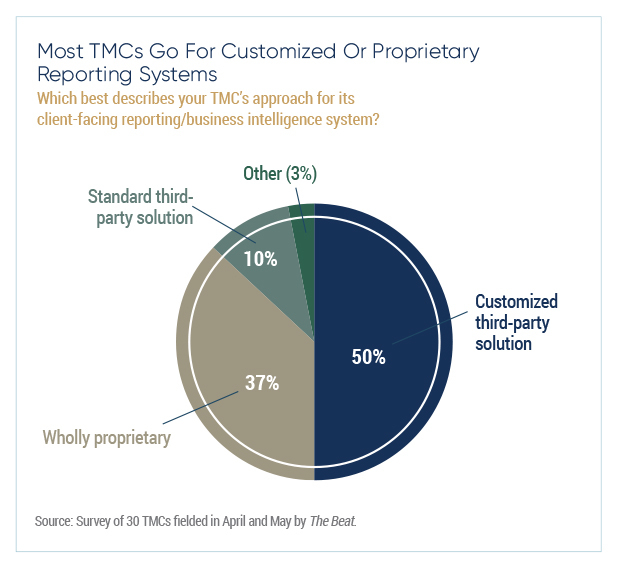 Among TMC respondents, most have either built their own proprietary mobile application or deployed a white-labeled third-party solution with custom development. This suggests TMCs like to have an element of uniqueness in their mobile offering. 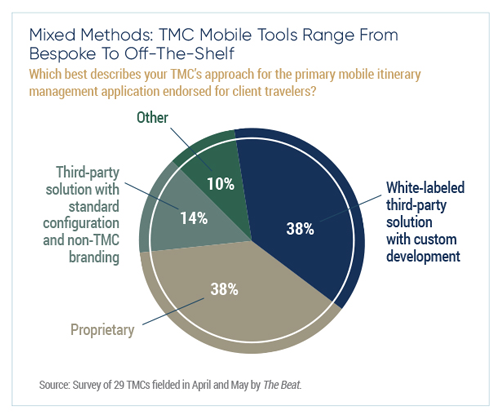 Others steer client travelers to a mobile itinerary management application provided and branded by a third party, such as Sabre’s TripCase or TripIt, owned by SAP Concur. Coming to market with names like Ella, Eva, Marco and Sam, TMC chatbots have arrived. Tapping into advancements in natural language processing and artificial intelligence, bots open up an automated channel of communication and servicing for client travelers to inquire about policy, get real-time details on their trips and even make travel transactions—all through text- or voice-based based systems such as Amazon Alexa, Facebook Messenger, Slack, SMS text and a TMC’s own channels. The Beat invited dozens of travel management companies to complete an online questionnaire to better understand where corporate agencies are investing in their businesses. Respondents to an online survey, fielded in April and May 2018, include a wide mix of agencies, from some of the largest mega travel management companies and multinational TMCs to national and regional operators. 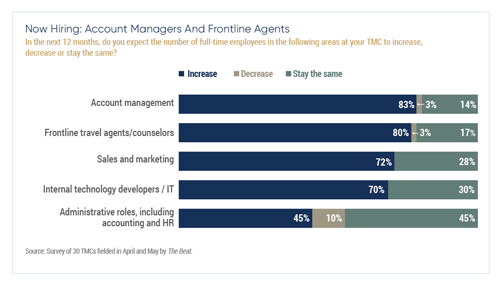 The Beat supplemented information captured through this survey through interviews with TMC executives, technology companies and consultants. The Beat would like to thank the TMCs that completed the questionnaire upon which the research is based: Acendas Travel, Adelman Travel Group, AdTrav, Altour, American Express Global Business Travel, AmTrav, Atlas Travel, Balboa Travel, Cain Travel, Carlson Wagonlit Travel, Casto Travel, Christopherson Business Travel, Corporate Travel Management, Egencia, Executive Travel, FCM Travel Solutions, Fox World Travel, Frosch Travel, Gant Travel, Hess Corporate Travel, Omega World Travel, Safe Harbors Business Travel, Short’s Travel Management, Teplis Travel, Travel and Transport Inc., Travel Edge, Travel Leaders Group, TravelStore, World Travel Inc. and WTMC. The Beat is the must-read digital publication for senior-level corporate travel professionals, providing breaking news, insightful views and compelling interviews on corporate travel distribution, travel management and technology. The Beat serves an audience of more 10,000 through its paid-subscription newsletter and website. The Beat Live is an annual conference bringing together over 125 senior travel executives. Our 11th annual event will take place in Atlanta, Oct. 3 – 5, 2018.